Chris' Automotive is a newly expanded facility to accommodate all of your automotive needs from service and repairs to collision and tires - they even do New York State Inspection. 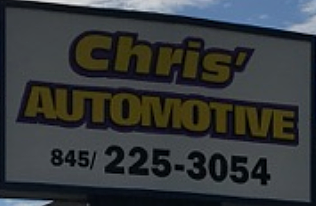 Chris' also offers free estimates and 24-hour towing! In business since 1991. Pin striping, fog lights, brush guards, bug shields, running boards, high performance parts, accessories. They are glad to perform all of the above services on cars and light trucks. What makes them unique? They offer everything automotive - soup to nuts. Have your fluids and coolant checked and your A/C recharged.